So, I know this isn’t exactly a tutorial – but this turned out so fun, cute and COLORFUL, I wanted to share it with you anyway. Who knows, maybe you were looking for something with a little ‘POP’ to it for the holidays! This Colorful Christmas Frame Decor is it! Simply put: pick 3-4 colors that you love together (me: purple, blue, green). In those colors, find some thick wired ribbon, some thinner ribbon (wired or not – wired does make it easier to curl, if desired), then some fun ornaments. Take a large frame, and paint it, if necessary. I used the same sparkly silver one I used for my DIY Days Until Christmas Countdown. Gotta love reusable crafts!!! Make a bow, use an accent ornament/decor item for the center. Then use the thin ribbon to hang the other ornaments/decor at random lengths from the top. 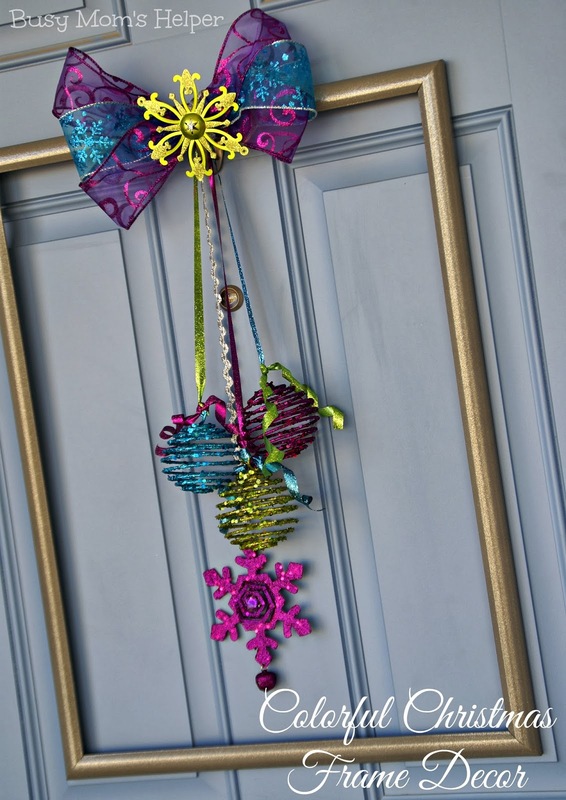 I absolutely love how this turned out, and was very pleased at how well the colors gave my door a bit of spunky holiday attitude!